Prone to aphids like most species…again, keep an eye on your plants. Overwinter in pots for annual zones. Be wary of overwatering. They don’t like wet feet! If you don’t want additional seedlings next spring, simply cut off the seed pods before they pop open or bind them shut with twist ties or rubber bands if you want to collect milkweed tree seeds. Seeding is less likely to be an issue for those growing in annual zones. This section is a work in progress because there are so few North American “gardening” reports about this milkweed species. If you have experience growing gigantea, please comment below to shed some light on this emerging North American milkweed variety. I just got one of these from my local nursery and it appears to be healthy and ready to grow- already lots of flowers on it. I’ve set it in the pot under and oak tree for a few weeks and it’s seems fine there- but it’s time to commit and figure out where to plant it- I have a lot of full sun locations, but being SW FL it’s HOT, and I really don’t want to kill this plant, I’ve never found one before and I may not find another. So can anyone advise about where these like to be planted? full sun, partial? Thanks! Hi Dianna, you really need to experiment to see where it thrives in your particular growing conditions…you could always take a cutting to start a second plant. Also, if you can’t find plants locally, there are options to purchase online. Very easy to root from cuttings. Put cuttings in wet vermiculite with root hormone and roots appeared after 3 days. A plant grown from a cutting will flower first year if taken from mature plant. Not sure how long it takes for a plant grown from seed to produce flowers. Was told there can be problems moving monarch caterpillars from tropical to giant (the change makes the caterpillars vomit.) Called a local nursery and they confirmed the opinion. What is your opinion on this? I switch my pillars all the time and have never had an issue. they go through the tropical faster so when I put them in my cage I have a giant milkweed in a pot since that lasts longer. 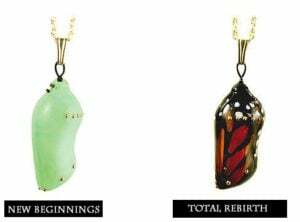 Most of mine pupate just fine other than a few that sometimes fail to emerge from their chrysalis or have really wonky wings. I’ve been able to release about 90% successfully this year. I’m in Central Florida zone 9 area. I keep most of my plants in containers so I can move them into the cage easily if I need to but I’m about to put a few in the ground as they are getting rather large. I keep the containers in areas where they get 5 to 6 hours of Sun. I have these in my garden and we suffer from some issues with the leaves, but they are thriving. My question is my butterflies are emerging misshapen and deformed. They all die. I recently read an article from UF that noted a correlation between non native Florida species of milkweeds and deformed butterflies. Has anyone else experienced this? Could it be something else? Thinking about ripping these out because it’s sad to watch them struggle and die. 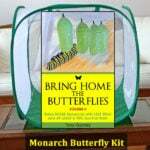 I also live in S. Florida where the monarchs lay eggs year round in my garden. When my plants close to being stripped of leaves to feed them I use butternut squash. I slice it thin, like leaves, cut the outer rind off and spear them onto the bare milkweed stems. I move the older, chubby cats onto them and leave the remaining green leaves for the younger cats. If you are ever in the Tampa area the Florida Botanical Garden in Largo has a beautiful example of this plant. I am so jealous! It is hard to get the seeds to germinate. I am on my 2nd batch and only 2 are “possibly” sprouting. I will be looking to purchase a plant to obtain it. I would like some information about the root system of these as here in south Florida we have sprinkler systems underground and the “wrong” root system can destroy your system. Last spring, 2017, I grew a Calotropis Procera from seed. I am in Illinois so I took it in in the fall. Around the 1st of Feb. I noticed it had flower buds which should not happen to a 1st year plant much less in winter. I keep the plant in the worst possible conditions. It is 3 feet from a east window, the room is usually in the 60’s and it gets very little sun. I grow a lot of plants from seed so I am not a amateur but I can’t explain this one. I am surprised the plant even survived much less grow. Has this every happened to you? Why the crown flower fruits have yellow bacterial on the outside. how to send picture? I’ve been raising monarch caterpillars for about 3 months now… The Hungry Catepillar book wasn’t lying! What’s the best to to grow my supply of crown flower? Is the cutting/in water method or seed method better? Looking to start at least 5 more plants. I have always had a black thumb, but I do have an aquaponic system that gives me fish-poop water for my plants which helps a lot. Hi I live in miami. Found these at a local nursery-the lady at the shop knew nothing except that these plants attract butterflies. I figured why not try? So I bought about 8 plants. They have been in the ground in my front yard for about a month. When the leaves started turning yellow, I cut out one day of water and that seemed to help. Now, they are growing tall and fast. Maybe too tall…might need to cut them down to size. They flowers are constant and beautiful. The leaves open and face the direction of the sun. I love this plant/flower…feels very alive as they are constantly changing. Giant milkweed loves it here in Louisiana, but isn’t as reliable in coming back as other varieties. Aphids get on it also, but that’s a given in this zone. Hi! I’m fairly new to this and have a few plants that aren’t native to western PA. One being the Calatropsis. The plant is blooming and growing but keeps getting strange brown spots on the leaves. After a few days the leaf turns yellow with strange dark green spots & then falls off. It isn’t affecting all leaves, just some. Does anyone know what is causing this? It’s not overwatering yellow, that I have seen before. Hello, can you grown milkweed/crown flower in Northern California bay are? Hi I have calotropis gigantea seed. I want plant them. I know I need to plant first two months inside. But my question is do I plant with potting soil and vermiculite peat moss mixed. Then water them? If so, how many times do I water them in a week? Please reply. hi Minu, you don’t have to start them indoors unless your climate is too hot or too cold for seedlings to thrive. Keep in mind these thrive in warm climates and are very drought tolerant. Our C. procera responded well to slow release fertilizer. Hi tony thanks for replying I have plant it almost month ago, but nothing is coming. I plant in potting soil with peat moss. Nothing is coming. Is it ruin or it takes time to grow. Plz reponse. Hi Minu, typically the seeds germinate pretty quickly if they are viable but some will surprise you and sprout up later…you might want to find seeds from a different supplier or seek out a plant locally. good luck! 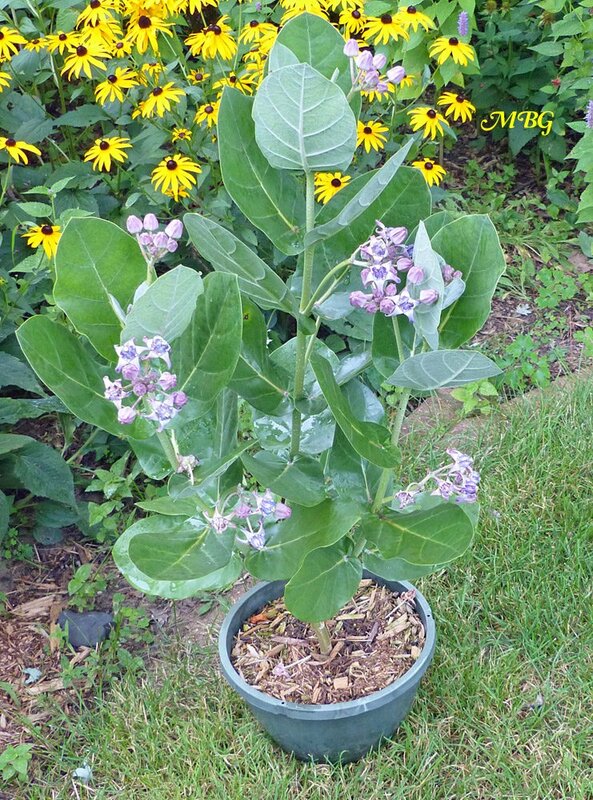 Growing calotropis gigantea from seeds…unfortunately only one sprouted, then four of calotropis proctera and i just started to transplant them into bigger pots, but I’m wondering if this kind of milkweed have a tap root or not….any suggestions??? Gonna grow them in the containers to overwinter in the greenhouse…. 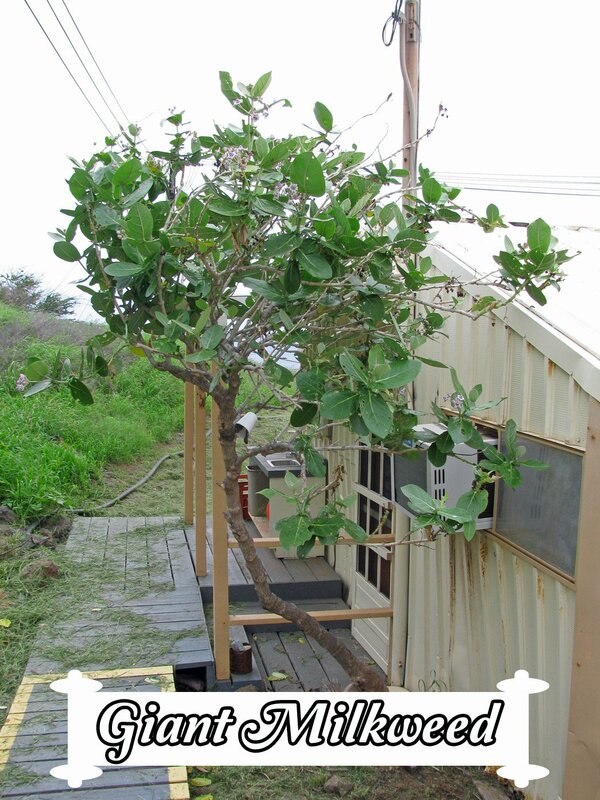 hi tony, where can i find the WHITE CALOTROPIS GIGANTEA root. Please advice me. I live on Long Island. A few years back I planted giant milkweed and it’s flourished. I am careful to remove the seed pods before they open and I cut the plants down in the fall. I’m concerned about it spreading. A few seeds must’ve gotten away because a few plants were popping up in cracks in the asphalt of my driveway! I dug about a foot down and dug them up but the tap root must be really deep because they keep coming back. Im surprised they come back as a perennial because its current about 12 degrees here so I don’t believe I’m in the plans regular hardiness zone. The milkweeds must not have seen the map! Any help with permanently removing the unwanted milkweeds so they don’t spread would be greatly appreciated. Thank you! Hi Janet, even if you cut off seed pods, some varieties will spread through underground rhizomes. I am surprised to hear it is spreading in your region. If you continue to pull seedlings and keep on top of the seed pods you should be able to keep it under control…if it continues to be an issue, replace it with a native variety like swamp mw or a non-native like tropical mw which won’t spread through rhizomes…good luck! My giant milkweed has a bunch of rust colored spots all over the leaves. I live in SW Florida. Is there any way to prevent whatever is happening? Will my plant die? I love collecting monarch eggs and growing them to butterflies, but I’m afraid they are going to stop laying eggs with the leaves all looking so bad. Thanks for any help. Hi! I was excited to see the “crown flower” in Hawaii, and learned about Monarchs and caterpillars there. When I came home to Riverside CA, I was driving around one day and spotted a huge specimen of this growing a few miles from me. It didn’t get much water, and grew in very hard soil, (in Southern California), so I took some branches, rooted them, grew it and am enjoying caterpillars and Monarch butterflies! My message is don’t baby this plant, it is a weed! Let it grow in the native soil, and once it’s established, it doesn’t need as much water. Hope this helps! I also lived in Hawaii and now live in Eastvale (near corona). 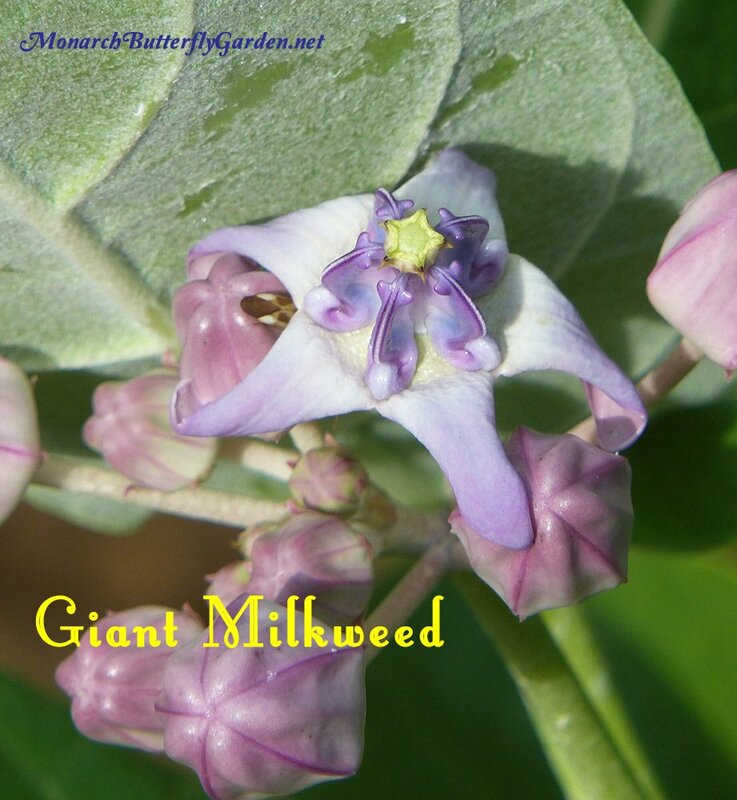 I loved my milkweed in Hawaii, and just received my order of seeds. I’m glad to hear I can grow them here! Last year I found this milkweed in my butterflies garden. Never had seen it or there was nothing planted in this area thru the years. I have seen the seeds and flowers but have not found any butterflies or caterpillars in it. I lived in zone 9, between Ocala and Orlando in Fl, a very small town. I have been trying to identified this plant since last year and finally thru the Agriculture Center in my town contacted someone in Missouri and they were able to identified it and they sent to us two links, your website and another from the Agriculture center in Missouri. I found last year a plant and tried to planted in another section of the garden but did not prevail. Mine at this time is all green leaves and growing. Will tried to do a cutting to have some in my backyard, hope it will grow. 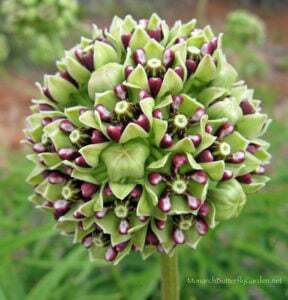 Hi Anita, Iam so elated that we have this giant milkweed in our area.I work at Indianna,Riverside ,would like to know if I can get a plant cutting from you. I purchased a live Calotrolis about two years ago. I was a single stem, 12′ long with a very small root ball. I have managed to keep it alive but it has been a struggle. As soon as new leaves appear and mature, they begin to look infected and die -not leaf miners or fungus.. The local nursery is mystified. I just replanted it yesterday and discovered that it had developed essentially no new root system. It is just limping along. After reading many of the entries on this site, I’m thinking of taking it out of the soil and just placing it in water, or using an entirely different type of soil. It had been in a fairly rich, mulchy but aerated soil. I just yesterday placed it in a “native soil” mix which contains less mulch, and a little more sand, and perilite. This is when I notice the lack of root development. Any suggestions? Hi Marianna, it will probably prefer the sandy soil you moved it to. It grows wild in arid regions of Africa, Asia, and India. Ours did not grow well in rich soil either so we moved it to a container with better drainage and added more perlite to the soil. I’ll be sure to post an update on our plant this summer. I’m in North Miami Beach 10b , I’ve been growing them for years. I’ve been reading the posts and see most collect then release. Curious as to why, my 3 plants are about 5+ feet high then get devoured down to the stems and they grow back. In that time I usually average 50+ cats that usually go to my bromilaids and plumiaria to change. Do you have better success catching and releasing? Just curious. This is my first time to have giant milkweeds in my garden in SW Florida. The cats love it. I am a snowbird and will be heading home to Canada in a few weeks and I am not sure if I should trim the tops of the milkweed tree to allow for growth and to ensure they don’t fall during high winds. They are about 6 feet tall right now. Will you please advise on how to take care of these plants. Hi Kathleen, I am a northern gardener so can’t say from first hand experience BUT I would cut back the plants to about 1-2 ft for a couple reasons: 1. To let healthy growth emerge in case the leaves/stems have OE spores 2. So they don’t topple over like you suggested. You might also contact a local nursery to see if they have other ideas. good luck! Thank you, Tony. By the way, I love your website. It contains a lot of valuable information. Recently moved full time to Homosassa, Florida. My Giant milkweed branch (rather than single stem) and grew to 8′ tall. Late this summer, there were few caterpillars and the Monarchs preferred the Tropical. However late this fall, there were several cats on the Giant. Formerly I successfully grew a 100+/- in Michigan during the summers. I have had more incidents of parasites here in Florida. 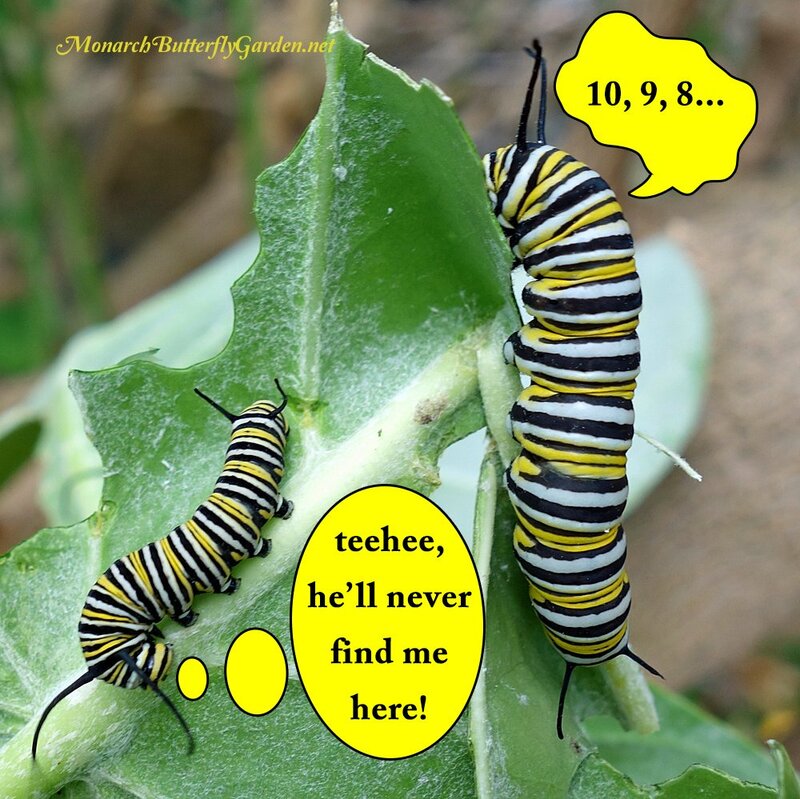 Do I understand correctly that the danger occurs when the Monarch ecloses and the spores then fall from the wings…..is that the primary means of contaminating the caterpillars? I’ve not known; Its a concern in raising greater numbers here in Florida. Thanks for the information! I live in Hawaii on the island of Oahu. I bought two purple crown plants which i repotted into bigger clay pots. I currently have 22 caterpillars that just molted into 3rd instar. My crown plants are looking quite bare. They haven’t been producing new leaves as quickly as I had hoped. They have grown taller but not giving me new leaves. I’m wondering what I can do to produce more leaves. I have given them fertilizer and they are in part shade/sun, I water in the evenings. Thank you for any advice you provide. My two suggestions to see if you could get better results: 1. Water only when the soil starts to dry out 2. 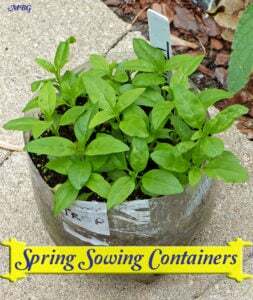 Try planting one directly in the ground and see if it grows more foliage compared to the container plant. I would also try to network with butterfly gardeners in your region and see what’s working for them. good luck! I have a question… I planted my giant milkweed where I thought the tree would add filtered shade to the plants below it. Now it’s obvious it’s not the tree type but the shrub type. I never wanted to prune it because there are always so many cats on it, but it’s a little out of control. It’s about 7 feet tall and is needing propped up ! If I prune it like any other shrub, will it branch and become fuller ? Hi Nathalie, I’m not sure where you’re located but most people in the US report no seeding with gigantea. I just took a stem cutting of our procera and it was about 4″… 4 or 5 leave nodes. Ps…the rooting media would be the potting soil, peat moss, perlite, etc. I live in SouthEast Florida right before the Keys, so my results may not be typical to y’all in Minnesota, but I had 98% success in propagating Giant Milkweed from cuttings. I bought six huge plants from ButterflyWorld. I cut off every branch and some of those I cut in half. I ended up with a pile of pieces from about 1’ to 3′ long. All the talk about cutting below leaf nodes didn’t seem to matter to my results. Nor did whether the stem was still green wood or old brown wood. Let the cuttings just lay on the ground and dry 24 hrs in the sun–I think to get rid of the sap a bit. I then made dozens of pots with half topsoil and half potting soil mixed up. I took each cutting and “whittled” off the outer skin with a sharp knife. I then took the point of the knife and cut inch-long trenches vertically up the stem from the bottom to about an inch up–I think this allows the rooting hormone to access the innards of the stem and bring out starter roots. I then dipped that 1″ length of stem into Rooting Hormone. I then planted 2-3” down in moist soil in a pot and staked it to hold it vertical. I put two stems in each pot. Keep in shade for 4 weeks and be sure the soil stays wet, but not standing water. Move to sun but keep in pots for another month. Water daily to keep moist, as needed–I use a little cheapo soil tester for moisture. Transplant being sure the plant will never have “wet feet. So plant it in a dry spot or be sure not to plant it deep and have it on a “mound”. Water every other day for 2 weeks after transplant. After that, it doesn’t like to get much water. If the lower leaves turn yellow and fall off, it means it is getting too much water. I had only 1 cutting out of about 30 not survive all the way through transplanting using this approach. Found you site by searching for answers to MW disease problems. I have been spraying my milkweed with 2 parts water 1 part milk and have seen some good fungus control, but not all. I’m going to try the hydrogen peroxide therapy. I have a large healthy C gigantea bush that has a lot of action. It did have the fungus, but with dedicated spraying and severe cutback, and collecting the dropped leaves from the ground, the leaves are nice and healthy now. I read in one of your answers that CG does not produce seed in the US. I wonder where the folks selling it on Ebay get their seeds then. That answers one of my questions as I have never found a seed pod on my CG. Also, one of the posts state that CG and Calotropis procera are the same, that procera is the obsolete name for CG. Is that true? Great information on your site. I’m so glad I found this website! I just ordered some giant milkweed seeds to grow here in S. Florida, as the plants are very, very hard to find. We’ve always got so many caterpillars and not enough food for them. I’m hoping these will grow fairly easily. I was also given a couple of little branches, and they are doing very well, Just stuck them in some potting soil and kept them moist. Its just that the caterpillars eat what little leaves they did have on them, so fast! Hi Barbara, once you get this milkweed established, it can feed an army of monarchs. Good luck and keep us posted! I’m sitting at Butterfly World in Coconut Creek right now. They have nice plants here and we are taking one home. Thanks for such a great website. My first giant crown plant just arrived from Florida. I am hopeful it will thrive here in San Diego. Any suggestions? That’s exciting news Jen! Make sure your plant gets plenty of sun and that it’s in well-drained soil. It should grow well in your region. Please keep us posted. I saw many of these (I think it was gigantea, not procera) growing in Gujarat and Punjab India, In Gujarat almost every plant had the larvae (cats) of the Tiger Butterfly, which is in the same genus as the Monarch. The caterpillars look almost identical to the Monarch!! Thanks for the report from India, Jesse. It’s fascinating to hear about distant monarch relatives! Aloha, I live in Kailua, on the island of Oahu, in Hawaii. (BTW, what zone is Hawaii? Haven’t seen it mentioned anywhere ) I planted a Giant Milkweed about 2 years ago in the hopes of starting a butterfly garden and only now am I devoting time to it..
About 5 weeks ago I bought a Critter Keeper and started collecting cats and am placing them in small glasses with about 1 leaf each per day. The frass got so messy that I then got a wire cage that has a pull out drawer for easy cleaning, I covered it with window screen material and moved the cats in there. I am having wonderful success. I am releasing an average of 2 butterflies per day, have about 20 crysalis, and usually about 20 to 25 cats. Each day I am collecting at least 5 cats of various sizes to move into the cage. Don’t know if this is the height of the season, the winter has been pretty mild, but the cats seem happy! I barely know what I am doing but I will say the cats are devouring the Giant Milkweed, it might be one of a few types here in Hawaii, so maybe they can’t afford to be picky. I will start rooting cuttings in water shortly. Having so much fun and would appreciate any comments and tips! Aloha Marcia, Kailua, Oahu is zone 11a for future reference. Kritter keepers are good for raising small numbers of caterpillars, and I find them easy to clean because you can just dump frass in a waste basket and then rinse out the cage. Congrats on raising your first monarchs! The “poopoo platter” that is mentioned in your post looks like a plastic flower pot liner for putting pots on. I use these. In my larger cages I use plastic shoe boxes, for fras collection in my rearing cages. I put m/w cuttings in vases, place the vases in the shoe box, and place all in the cage. My “goal” one day is to devise a cage with a slide out tray at the bottom (much like a birdcage tray), but for fras! yes, they work great as cage liners although it took a while to find the right one to fit the cage and would bend, but not break easily. Cuttings have really been a game changer for raising and make the process so much easier with less wasted milkweed. Your monarch cage idea sounds interesting…good luck! Hi Terry, I remember hearing this from others too. Perhaps a lack of native pollinators. Gigantea may be a variety that’s best for raising caterpillars. 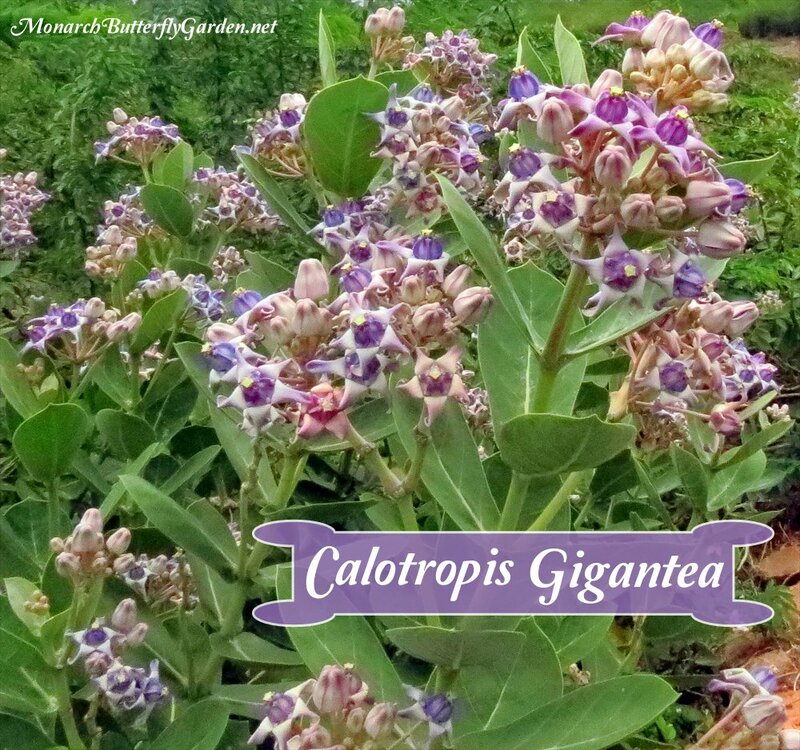 Calotropis procera, on the other hand, is also a nectar source for monarchs, hummingbirds, and bees. I will post about whether that seeds this season. I’m not sure how it will like our shortened growing season in Minnesota, so you might want to try that one for yourself. I am in Naples, FL and have grown Giant Milkweed for 3 years and it survives and blooms all year. Yes, the caterpillars prefer other Milkweed in my garden, but do eat the Giant as well. It hasn’t taken a tree shape as the photo shows, but they do get 8 – 9 ft. tall. Fantastic information…thanks for sharing Judith! I live in the Cocoa Beach area of Florida. Zone 9. I have many of the Gigantea growing in my gardens. I have not seen any aphids but plenty of the milkweed red beetle. After winter the Monarchs and Queens only lay on the real Milkweeds. If I’m collecting cats to bring in I will feed them these large leaves when the get to 3rd or 4th instar. They will readily eat them then. Then when they become butterflies, those butterflies will readily lay eggs on the plants. I propagate with cuttings, rooting hormone and garden soil. Works for me. I have never had seed pods. Weird. Growing Calotropis gigantea in The Villages, FL (zone 9A). It’s a statuesque plant that likes part shade, sandy soil, and fairly dry conditions. 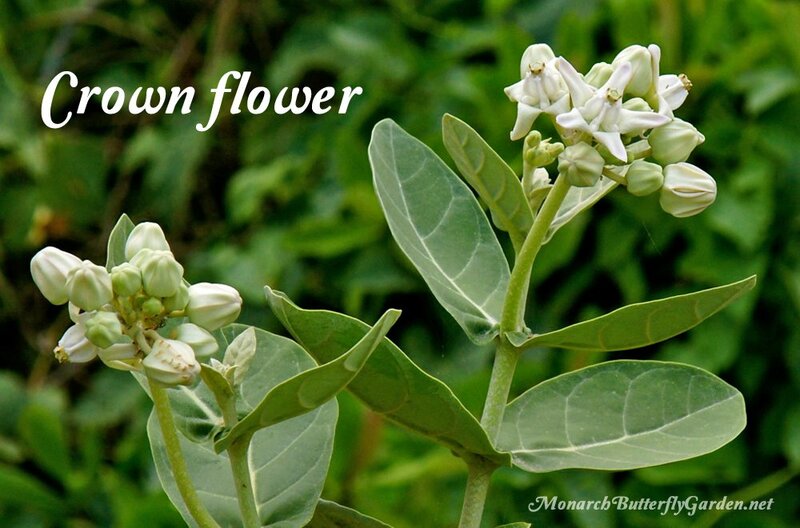 As Vicki from Tampa writes, cats like tropical milkweed and native milkweed better than the tough leaves of calotropis, but I’ll continue to grow it for its beauty. Thank you for sharing your experience Ann! Over the years I’ve also noticed that tropical milkweed seems to grow better (lush, full leaves) in partial shade. Can you post shots of your overwintering set up? Hi Carol, I will be posting some overwintering updates soon. My “set up” is pretty makeshift. Tables in front of a south facing window + overhead CFL lightbulbs in standard sockets. Have not previously grown this, but I have seeds for this and Calotropis procera. Look forward to growing them in my Zone 5b garden. Will try to over winter in my basement. Currently have 4 Tropical milkweed there under lights. Unfortunately, this one is an aphid MAGNET!! Hi David, if you cut back infested areas of aphids and use isospropyl alcohol to treat the rest, you can eliminate them indoors permanently..good luck! This grows very easily outside Tampa, FL. and mine has always come back from the cats and the cold. It’s the “last resort” though, they seem to prefer the tropical, then the native swamp and only eat these very tough leaves when it’s the only milkweed in the yard. It roots very easily in water but not at all in potting soil — the opposite of my experience with other milkweeds. Hi Vicki, if you use rooting hormone powder and place it in a peat moss mix this is supposed to be optimal for cuttings. It also helps to stake the cutting so it remains upright while rooting. However, if it roots easily in water…that’s the way to go! I really like doing this with tropical…so simple! Hello! This was sold at a local nursery here in Central Florida. It is a beautiful plant, and the cats loved it. It was completely stripped, and although I hoped it would come back, it did not 🙁 I will buy another one next time they are available, and make sure it doesn’t get eaten up completely. It was wonderful to be able to take a big leaf and throw it in my cats’ container. They don’t wilt like other leaves. Thinking of getting these as an annual here in Pa. because they are so beautiful Seana! Did you see tons of aphids on them? Always a big problem here.